No matter what language you’re learning, games make the journey to fluency more fun and exciting! Board games, apps, and group activities also help you practice your skills more efficiently in between private language lessons. 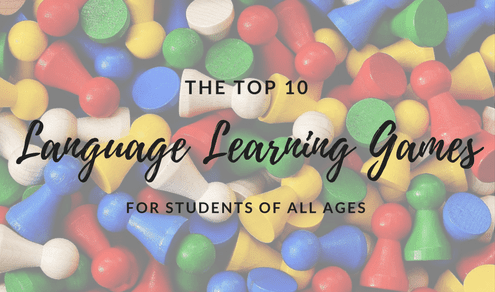 For memorizing those vocabulary words and mastering your grammar, here is a list of the top 10 language learning games available today. Memorizing phrases in your target language is easier with the help of a little rhyme and rhythm. With this fun app, you get to select songs in the language of your choice, see the lyrics translated, and learn to sing along. The Pro Version of the app comes with more advanced exercises. For more comprehensive practice, this app allows you to choose from a variety of learning games such as spelling tests, crosswords, and hangman. Each game tests a different skill, so you can apply your knowledge about spelling, vocabulary, sentence structure, and more. These vocabulary games are another great way to boost your memorization skills. Choose from several games including Letter Blocks, Unscramble, and Slang Game. You can play on a computer at home, a tablet, or a mobile phone. With its addictive quests and challenges, the MindSnacks app helps you practice vocabulary, grammar skills, basic verb conjugation, and spelling. This game is available in multiple languages and will keep you motivated as you learn. If you’re a visual learner, this app is perfect for you. Lingo Arcade will help you with word identification and sentence structure using over 3000 visual aids. The app is currently available in Spanish, French, German, and English. How much can you learn in five minutes? With this app, you get the chance to test your vocabulary knowledge by matching words and swiping as you learn. As you increase your speed and accuracy, the game will “drop” more new vocabulary words. Practice how to build sentences with these unique color-coded cards. To play the game, you’ll match cards with different words until you create a grammatically correct sentence. Each card correctly matched is worth one point. Scrabble is a fantastic way to practice your spelling and vocabulary skills. Have a friend join you for this fun game where small, lettered tiles are placed onto a board to form new words. Scrabble is available in multiple different languages. To make your own Bingo game in the language of your choice, create a set of vocabulary-themed Bingo cards in a 6×6 pattern. In each box, include the vocabulary words you want to practice. Next, write the vocabulary words on a set of smaller cards. Choose a player to call out the words. The person who completes their card first wins the game! To play Jeopardy with a group of others who are learning a language, choose 4-5 categories you’re familiar with such as food, people, places, and animals. Each of these categories will be its own column on a board with five rows. Fill in the boxes with the answers to a set of predetermined questions. Remember, one player will need to be the host. Each of these interactive games will help you improve your language comprehension skills. You can play these games in between language classes to review and reinforce all you’re learning in a fun way. Barbara S. has been teaching Spanish since 2011 and is a native speaker from Argentina. Her teaching style is flexible, cooperative, and understanding. Learn more about Barbara here! Thanks for this lovely write-up! I really like Scrabble and I have played it in Chinese (using the same English board). So I agree that may be useful as well as a similar “speed-Scrabble” game called Bananagrams. I also make challenging language-learning card games experienced gamers should love at LanguageCardGames.com if anyone is interested! Cheers!